Nils and I went looking for fall foliage today, and at his suggestion we visited some temples toward the north-east of Kyoto. 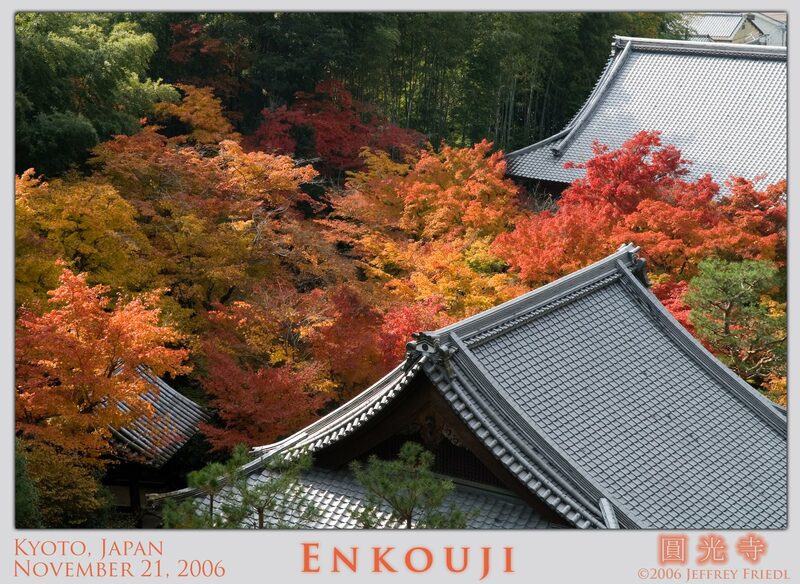 This picture looks down on the Enkouji Temple (圓光寺), which dates to 1667. The fall colors are only just starting, but it's a good start. It was a most excellent day, but I'm exhausted now. I was planning on posting just two or three pictures, but after my first pass through them, I came up with five that I just had to show. But after preparing the first one, I was so tired that I had to stop. So, many more pictures in the days to come. I like it. The colours are nice and each roof looks like it’s floating on a sea of gentle autumnal leaves. A very nice composition. I also like the drop shadow effect that has the picture floating above it’s background; but shouldn’t only two sides have that effect?